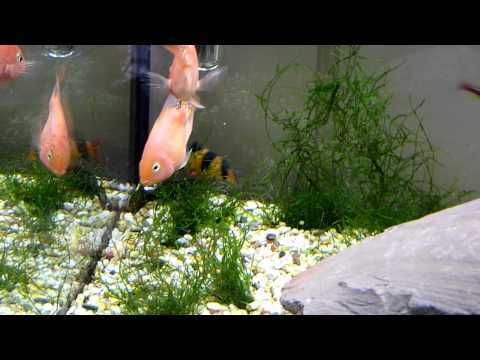 This entry was posted in fishy and tagged blood parrot, freshwater, ghostknife. Bookmark the permalink. your aquarium is a bit small.try making a small pot with a hole in it your black ghost will like hiding in it.i have 4of em.The aquarium shop which I buy my fish keep some transparent tubes for their black ghosts and mud pots with holes for their parrot fish.I have 2 shubunkin goldfish,2 orange finned loachs,2 sucker cats,1angelfish,4 black ghosts,3 comet tail goldfish.Black ghosts are nocturnal place them in dim light conditions. on the video it looks like its dark blue/purple. Is this correct or is this just a trick of the camera. Hi. It might just be the colour balance on the camera. He is certainly more black than anything else. Thanks, is their no such thing as a ghost knife fish being any other colour than black then? Because if not, im wondering where you can get one that isnt black and put him in my tank. Hi. I have seen ghost knife in brown in shops. They cost more than the black ghost knife if I recall.